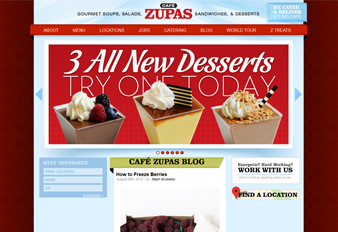 Café Zupas has 11 locations across Arizona and Utah. They specialize in offering gourmet salads, sandwiches and soups. Always using the freshest, high quality ingredients, they believe in providing a casual setting that is comfortable for patrons. Additionally, Café Zupas offers a drink bar, custom hot sauces, more than 58 salad ingredients, weekly chef specials and a sumptuous dessert menu that features an assortment of seasonal dishes. Adaptivity Pro offers Internet marketing and design services to companies within the U.S. and internationally. Under the acclaimed leadership of president and CEO Eric Morgan, Adaptivity Pro has made a successful mark on the Internet marketing industry. Creating highly unique, customized plans that tailor to each client’s industry and business goals, they are able to create successful marketing packages that ultimately increase revenues and build growth. Their dedicated team of programmers, designers and writers works together to formulate an Internet marketing plan that is rich in SEO and PPC content, ensuring that Internet-driven success is given the topmost priority.